Sergeant Darrell Curley was shot and killed when he and another officer responded to a domestic disturbance in Kaibito, Arizona. The dispute involved a fight between two brothers at a housing complex. Sergeant Curley attempted to subdue both brothers with pepper spray when they resisted arrest. As he attempted to place them in custody the father of the men opened fire, striking Sergeant Curley. Despite being wounded, Sergeant Curley was able to return fire. Another officer who had responded to the scene was also shot and wounded. Sergeant Curley was transported to a hospital in Page, Arizona, where he succumbed to his wounds early the following morning. The father was charged with first-degree murder in the federal courts. In July 2012 he pleaded guilty to second degree murder and was sentenced to only 35 years in prison. The two brothers were charged under tribal laws with homicide, disorderly conduct, and other offenses. 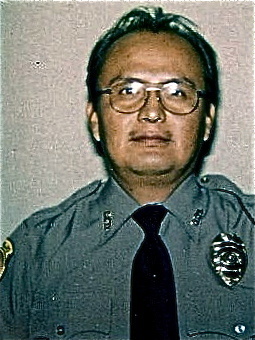 Sergeant Curley had served with the Navajo Division of Public Safety for 25 years and was assigned to the Tuba City District. He is survived by his wife, three children, grandson, parents, siblings. RIP Sergeant Darrell Cervandez Curley.